DeFoe, a Knoxville native and resident, won the tournament with 44 pounds, 9 ounces, after weighing daily limits of 12-10, 16-15 and 15 pounds. Patrick Walters of Ladson, S.C., took second with 41-4, and Brandon Lester of Fayetteville, Tenn., was third with 40-13. Japanese angler Toshinari Namiki of Tokyo finished fourth with 39-9, and finishing fifth with 38-5 was Garrett Paquette of Canton, Mich.
DeFoe also won the Open on Douglas Lake held this same week last year. In addition, he took home the victory at the 2014 Open on Douglas. Paying attention to the aggressiveness of the bite was another key in choosing the best lures to use. 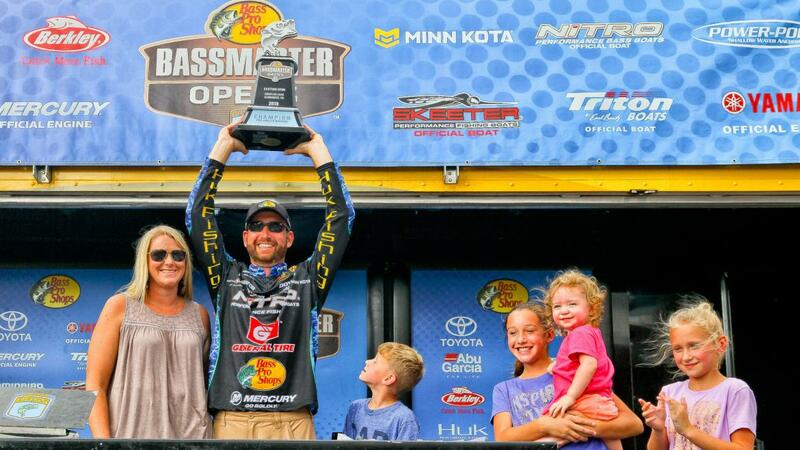 On Thursday, DeFoe anticipated catching his fish on fast-moving reaction baits. After catching none he slowed his presentation by flipping a jig into shoreline cover. Making the switch produced subtle bites, and the confidence lure reassured him of fish presence in the area. “I could tell then the bass weren’t biting as aggressively as I anticipated they would,” he said. On Friday DeFoe made a bold move, switching to a most obscure lure choice for the swift, cool water pouring over large boulders and through overhanging trees and laydowns. That choice was a 2.5-inch Terminator Walking Frog, a lure he had never used in the familiar water until then. At times when the bite was less aggressive, including today, he chose a 6-inch Bass Pro Shops Magnum Fin-Eke Worm, rigged on a 3/0 VMC Ike Approved Heavy Duty Worm Hook with 3/16-ounce weight. Walters used a one-two punch of lures and tactics to maximize strike potential in his area. In the Nolichucky River he located a series of shallow shoals surrounded by the channel. An abundance of baitfish was the key draw to the area, where Walters set up within casting distance of the shoals to target schooling bass. “Without much warning, they would begin feeding when the baitfish schooled on top of the shoal,” he said. He used a River2Sea Whopper Plopper Silent 110 for the schooling fish. When that action subsided, he switched to a 3/8-ounce Zorro Baits Booza Bug Jig with 3.5-inch Zoom Z Craw Jr.
Don Bible II of Knoxville, Tenn., won the co-angler division with a total weight of 20-11. Bible fished with boaters Parker Motts, Sam George and Bobby Lane Jr. Bible has two previous Top 12 finishes as a co-angler in this tournament. A 3/8-ounce Z Man Original ChatterBait was his lure of choice. Bible also won a Triton 179 TrX powered by a Mercury 115 ELPT, a trailer and standard factory accessories. Chris Hart of Franklin, Tenn., earned the Phoenix Boats Big Bass Award of $750 in the pro division by catching a largemouth weighing 6-6 on Friday. Also on Friday, Bible caught a largemouth weighing 5 pounds to win the Phoenix Boats Big Bass Award worth $250 in the co-angler division. Walters earned the Power-Pole Captain’s Cash Award of $500 on the pro side for being the highest-placing angler who is registered and eligible and uses client-approved product on his boat.